Creation VI (meaning Creation 6) is an ambient/drone project of Ukrainian sound artist Tim Six, born in Crimea in 1985. Started in 2006, Creation VI plays different kinds of drone & ambient music, using acoustic instruments and voice as primary source of sound. During 2013-2016 project was a duo with Valeria Kostyornaya (Aloe). 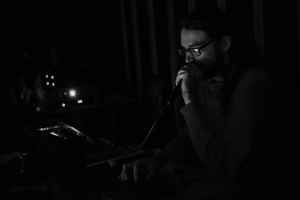 Usually described as "organic" and "primal", sound of the project is based on live-looping and real-time sound processing, combining primitive ritual music practices with improvised electronic minimalism and field recordings. Creation Six moniker is used for harsh noise / dronewall material. A release claimed to be from Creation VI and titled The Timewhere floats on the Internet, its status is uncertain, it can be an elaborate April fool's day prank played by a yet unknown entity. We do not know if was authored and released by Tim Six or a third party. Here is what we know about it. Новый альбом кудесников Creation VI, преплавляющих и легирующих примордиальные архетипы в гудящем котле с гудроном. Звучание проекта, название которого недвусмысленно указывает на шесть дней библейского творения, приобрело еще больший привкус экспериментальной алхимии — участники проекта известны тем, что уже более десяти лет совместно и методично ищут закономерности трансцендентности и пути к традиционному знанию посредством совместного звукотворчества, а новый альбом показал новую грань ведущихся исследований. Звуки варгана и каратал периодически пронзают мощный дрон, который как будто сгущается вокруг слушателя, подобно плотному туману в лесу. Дополнительную фактуру добавляют взаимодействия музыкантов с видоизменёнными сосновыми побегами, которые переносят воображение слушателя в волшебную чащу, в которой чуствуется неиллюзорное присутствие духов леса, голоса которых касаются слуха и ведут за собой. A new album of Creation VI magicians, melting and alloying primordial archetypes in a buzzing cauldron with tar. The sound of the project, whose name unambiguously points to the six days of the biblical creation, has acquired an even greater taste of experimental alchemy - the project participants are known for more than ten years jointly and methodically looking for the patterns of transcendence and the path to traditional knowledge through joint sound production, and the new album showed a new Facet of ongoing research. The sounds of a harpoon and a karatal periodically pierce a powerful drone, which seems to thicken around the listener, like a dense fog in the forest. The additional texture is added by the interaction of musicians with the modified pine shoots, which transfer the imagination of the listener to the magic thicket, in which the non-illusory presence of the spirits of the forest, whose voices touch the ears and lead them, is felt. On the 2nd of April at 19:00, Creation VI, which is the account used by Tim Six on VKontakte, posted a denial message reproduced bellow. шутка, а не какая-нибудь хитрая многоходовочка. В общем, если что — мопед не мой! Слушать не возбраняется, мне не жалко, просто имейте в виду, что никакого отношения к Creation VI этот альбом не имеет. Такие дела! PS: А настоящий новый альбом, о котором я писал ранее, выйдет ориентировочно в июне, на модном значке Cryo Chamber, ждите вестей и не ведитесь на провокации! I do not know whose hands it is, but apparently by April 1, someone decided to "release" me a new album, and independently recording music for him and making a cover! In addition to the post below, Google finds this opus only on the rutreker, where the first track is the same "mine" as the whole album - here is the first track from last year's album. All the rest is completely canonical darkambient, I do not know whose, but quite a quality performance) Even with a harp in one track! In general, the joke turned out to be very complicated, the meaning escapes me - if it's a joke at all, and not some tricky multichamber. In general, if anything - a moped is not mine! It's not forbidden to listen, I do not mind, just keep in mind that this album has nothing to do with Creation VI. So it goes! PS: And this new album, about which I wrote earlier, will be released approximately in June, on the fashionable icon Cryo Chamber, wait for the news and do not get carried away on provocation! ▼KATABASIA▼ looks to be a legitimate VKontakte user which publish graphical arts and music related messages, it seems unlikely he is the source of the release, he only relayed the Rutracker post. At the time of the Rutracker publication, user rotten111 was labelled as active on the site for 10 years and 6 months, this user may also not be the release originator, he could be just a person who repackaged the release as MP3s for distribution through BitTorrent, files which he may had access to by other means. These means remain unknown to us. This record was known since 2017-03-15 when a Discogs user named Sonic-Mechanic submitted a release with the correct cover and track list. The format was claimed to be FLAC and was due to be released on 2017-03-17. (Note that the files that were available through Rutracker were only in MP3, we searched for the FLAC files but were unable to locate them.) Later he changed that date to be 2017-03-27 "due to delay". When asked about the actual existence of this release he wrote: "Album is released, but availible [SIC] only for those who have download codes. How is it possible to verify it?" Sonic-Mechanic may be close to the actual source of this record as this Discogs account was created on 2017-03-12 and his only activity was the submission of this release, the release date correction, and a brief comment. The account may had been created for the sole purpose of communicating to the public the existence of this release. The closeness of this Discogs user is corroborated by the dates embeded in the cover image EXIF tags: it was created on 2017-03-14 at 10:27:07 (+03:00) and last edited the next day at 00:48:38 (+03:00). The time zone is of interest as it is coherent with a Russian origin, however this is not a strong evidence because the image producer may have been in any of the countries whose legal winter time is UTC+3, the time zone of the computer used may also had been artificially set to that time. Examination of the MP3 files gave no insight except that they could had been made from a lossless source which was mastered or produced as a whole due to the presence over all the tracks of obvious noise bands situated around 5.5, 11, and 16.5 kHz. Lame, the used encoder (version 3.99r), is not known to produce such bands. The conclusion of this investigation is that we do not know the source of this release, we can not rule out that Creation VI's denial message could be part of a prank, we also can not rule out that this record was not produced and released by an unrelated artist.